Your soft-serve machines are versatile! They can make soft serve ice cream, but they are also able to make frozen custard. This opens up a whole world of new flavors to try in the frozen dessert world. You could be serving frozen custard right now and reaping the chilly profits. Frozen custard is an extremely popular treat in the Midwest and New England, but it’s only starting to catch on in the other areas of the country. It was first produced in Coney Island by Archie and Elton Kohr in 1919. They found that adding egg yolks to standard ice cream created a wonderful texture. The addition of eggs also helped the ice cream stay cold. In their first weekend, the Kohrs sold over 18,000 cones! Word spread of this delight to the 1933 Chicago World’s Fair, where thousands loved their frozen custard. Custard expanded from there through the Midwest, with Milwaukee, Wisconsin being the frozen custard hub. 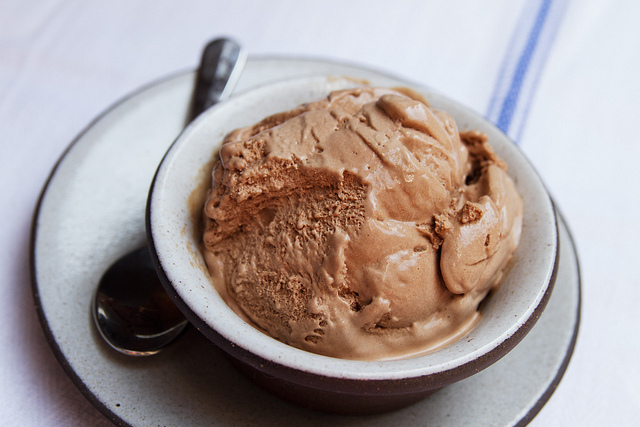 The egg yolks make the difference between ice cream and frozen custard. Frozen custard has to have at least 1.4% egg yolk solids and more than 10% milk fat. If it has less egg yolk or milk fat it is considered ice cream. True connoisseurs of the dessert will say that it can’t be dispensed through a soft serve machine and still be proper frozen custard. However, it all depends on how much overrun the machine puts into the mix. The dessert is dense enough that you can put in an overrun of 100% and still have a creamy product. Most frozen custard producers use a 20% overrun on their machines. The three big competitors in Milwaukee for frozen custard are Kopp’s Frozen Custard, Gilles Frozen Custard, and Leon’s Frozen Custard. All three stands have been open since the 1950s (or before) and feature a classic vibe in their service. Kopp’s is known for experimental flavors like Brandy Eggnog and The Famous Football Flavor, made up of chocolate cake batter custard, marshmallow, fudge, chocolate chip cookie dough, and chocolate cake pieces. Gilles custard can be found in the store, and is currently being distributed by Schoep’s Ice Cream of Madison, Wisconsin. The shop is a famous stop for Bud Selig, the Major League Baseball Commissioner. Leon’s Frozen Custard focuses their attention on doing a small number of flavors very well, notably butter pecan. We think it’s time that this dessert got a broader audience. Many shops outside of the Midwest are opened by people who moved elsewhere and missed the flavor of frozen custard. If you’re looking for a profit opportunity that can catch attention, consider adding frozen custard into your soft serve machine. Its rich flavor appeals to young and old alike, as it has for nearly 100 years. Have you checked with local dairy and/or Sugar Creek Farms or YoCream?